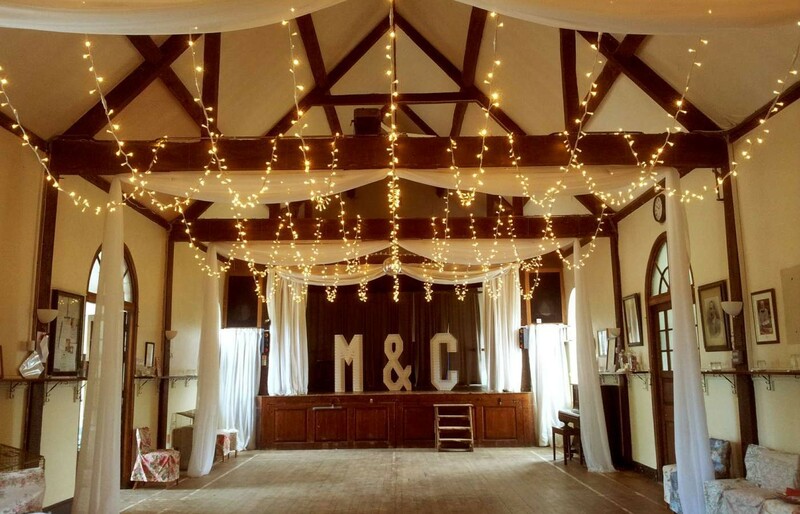 A village hall can be a wonderful space for a wedding reception, but they often benefit from a few extra touches to liven them up and to disguise some of the less visually appealing features. Buckland village hall is set in the beautiful village of Faringdon in Oxfordshire. In this case our brief was to hide the rather functional-looking fluorescent light fittings on the beams while adding some flattering light to the room with fairy lights. I just wanted to send you a little note to say thank you so much to everyone at Oakwood for lighting up our village hall for our wedding. You guys were amazing – I couldn’t believe how calm and professional you all were. All the best and thank you once again, I will definitely recommend Oakwood to all and sundry in the future. 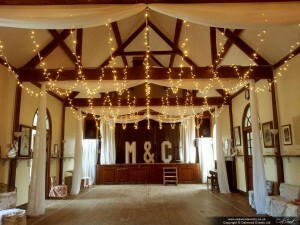 To discuss creative lighting options for your wedding, please feel free to contact us. We just wanted to say a HUGE thank you to you and your team for the AMAZING job you did with the lights! It completely transformed the room and hid the modern lighting really well. Everyone commented on the lights, they really set the scene beautifully!! Thank you so so much!